Windsor Lodge is now a property of WelcomHeritage Hotels. The resort is strategically located at a peaceful location, away from the hustle bustle of the Ranikhet town, offering splendid views of Himalayan range. Windsor Lodge was built as a quaint hunting lodge in year 1909. The resort was renovated in 1999 and utmost care was taken to retain the original architecture and colonial charm. Windsor lodge is equipped with modern amenities and offers an affair with the bygone era. Harkison Hall in Windosr Lodge is available for formal meeting, conferences, parties and functions for up to 100 persons for a format sit-down banquet and over 250 persons for informal gatherings. Facilities include state-of-the-art audio-visual and conferencing facilities. WelcomHeritage Windsor Lodge boasts 26 luxurious rooms in the categories of Deluxe Room, Super Deluxe Room, Deluxe Suite, Robinson Suite and Windsor Suite. All rooms & suites are elegantly furnished in colonial period style and well appointed with modern amenities including cable TV, hot / cold running water, telephones, mini-bar, tea / coffee maker and a live fireplace. 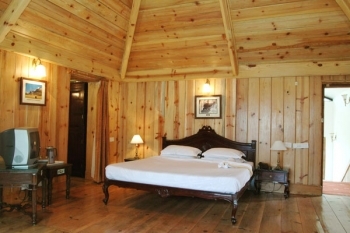 All the suites and rooms of Windsor Lodge recall the grandeur of the colonial era. The Kumaon Room - It is a multi-cuisine fine dining Restaurant in Windsor Lodge where you can savour the Kumaoni, Indian and Continental specialties. Kafal Bagh offers al-fresco garden dining at its best. Enjoy the mouth-watering food amidst the beauty of kafal trees overlooking pine forest and the golf course. Raja of Shiekhupura is a lounge and terrace serving a variety of beverages and snacks. The lounge is named in honour of Raja of Sheikhupura. The Tea Lounge is an added place to enjoy a pleasant evening and afternoons accompanied by delicious snacks and sandwiches. Kafal Bagh is a Al - Fresco garden dining at its best. Enjoy all the delicacies amidst the beauty of kafal trees overlooking pine forest and the golf course. The Tea Lounge is a colonial style tea/coffee house serving delicious snacks and sandwiches also. Harkison Hall is best for meeting, conferences, parties and functions for up to 100 persons for a format sit–down banquet and over 250 persons for informal gatherings. Facilities include state–of-the–art audio–visual and conferencing facilities. 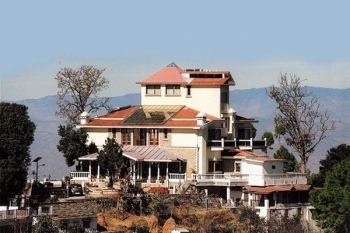 Ranikhet is well connected by motorable roads and it takes about 8 to 9 hours driving time from Delhi to reach Windsor Lodge & Hotel. The nearest railway station is situated 88 kms away at Kathgodam. Almora is 80 Kms, Nanital is 62 Kms, Bhimtal is 52 Kms, Ranikhet Bazar is 6 Kms, Jhuladevi Temple is 10 Kms, Chaubaria Gardens is 10 Kms, Dunga Lake is 10 Kms, Kausani is 59 Kms, Binsar is 75 Kms, Pindari Glacier is 240 Kms and Mukteshwar is 93 Kms from the hotel.